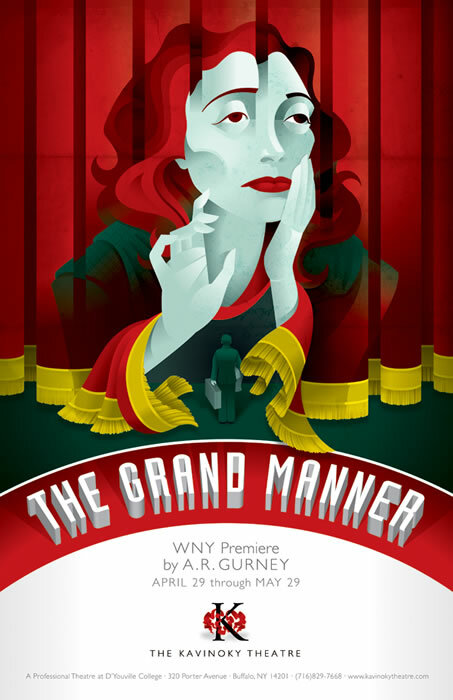 The other day, we were invited to attend the preview of the latest play that is being produced in the Kavinoky Theatre: which is A. R. Gurney's The Grand Manner. We attended and it turned out to be a play that was quite close to home, to Buffalo, that is. See, A. R. Gurney is a Buffalonian playwright. And somehow, for his latest play (which opened in Broadway last year in the Lincoln Centre), he decided to write about Katherine Cornell, who happens to be from Buffalo as well. Once upon a time, A. R. Gurney was a little schoolboy, and he met Katherine Cornell after a performance of Anthony and Cleopatra. A small meeting became the basis of a 90-minute no intermission play. So there are just a handful of characters in this play. There's Katherine Cornell, her husband Guthrie McClintic, Katherine's personal assistant, and A. R. Gurney as a teenage boy. All the dialogue revolved around the four of them, and to some degree, it is quite minimalist. But I suppose that is what I like about plays: there's just four characters, and the story line is thick and dense, and that makes things interesting. See, I can compare it to a performance of Edward Bond's Chair, which I saw back in 2008. It was a 90-minute no intermission play as well, and there were just a handful of characters as well. The conflict wasn't contributed by external factors, but the characters themselves provided the conflict. This current play is the same. We learn that Katherine Cornell's marriage is a lavender marriage, and that Katherine Cornell is having some feelings of disdain for her career as an actress. I also love the fact that it is a play about Buffalo. All the places that were mentioned in the play were real places in the city, and it gave me quaint feeling that allowed me to be proud of where I have been living for the past 6 years. Really, Buffalo is not just some cold wintry city in the north. Buffalo is more than that, and I guess this play just adds to that list. In the end, I enjoyed myself. I can add this play to the list of minimalist and dense works that I have enjoyed in the past: Chair, The Shape of Things, and so on. This play is playing until May 29, so you still have a chance to see it if you're in town.